The detailing and readability of this magnificent book from John White, the doyen of the viola and viola literature, is remarkable. 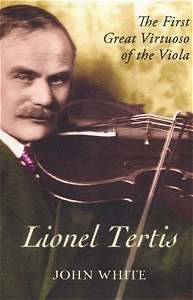 These aspects more than make up for any disappointment you may have suffered if you have read Tertis’s own: My Viola and I – A Complete Autobiography (Paul Elek, 1974) which to my taste rather scouted over context and detail. During the 1930s Lionel Tertis began to suffer from acute fibrositis in his right arm. This adversely affected his bowing and prevented spiccato playing. So handicapped did he become that in 1937 at the age of 60 he summarily announced his retirement from playing. In the same year he was reported as saying that his most immediate regret was that he would be unable to play the Romantic Fantasy for violin, viola and orchestra which he had lately commissioned from Arthur Benjamin. His farewell was made with a BBC concert including Harold in Italy and the Walton concerto. The retirement though quite sincere was not to last long. Mr White tracks Tertis’s story from far from lofty beginnings in 1876 in West Hartlepool to the move to London as a very young child to studies at the TCM in 1895. Along the way he eked out his student income by working as music intendant at a lunatic asylum in Preston. Tertis was not always a violist. He started with the violin but adopted his new instrument in the late 1890s. By the early 1900s he was probably one of the finest violists in the world. His style would have been virtually vibrato-less as was the fashion of the time. Judicious use of vibrato was later to become an essential part of his armoury. We are familiar with his championing of British music, commissioning, performing and encouraging a new generation of players and creators. Less familiar will be his pushing of the Mozart Sinfonia Concertante at Bournemouth and the Queen’s Hall in the 1900s and this at a time when Mozart had hardly any presence in English concert programmes. He performed that work throughout his career and was to record it in the 1930s with Albert Sammons and the LPO conducted by Harty. The sessions took place on 30 April 1933, the day after Harriet Cohen and Tertis had given a concert in the British Embassy in Berlin. John White completes other non-musical details for us. We learn that Tertis was a keen motorcyclist using his machine to get to concert fixtures. Later he acquired a Model T Ford. He took up golf until it started to affect his viola playing. His experiences during the Great War are vividly recalled as is his involvement with the Chamber Music Players during the 1920s. In 1924 they visited Newcastle. Tertis there tried out Bainton’s recently completed viola sonata although he never played it publicly. His American tours, in which he performed the York Bowen concerto, and his association with Mrs Coolidge and her circle are also recounted as is his return there after 1955. We hear of Tertis’s adventures with the RVW Flos Campi, Walton’s concerto and Tertis’s own transcription of the Elgar Cello Concerto. A second life opened up for him after retirement. He collaborated with luthier Arthur Richardson in the quest for the perfect size and proportion for the viola. Richardson was a quiet and introverted master workman while Tertis was mercurial with a highly flammable temper. Richardson was practical; Tertis, ever the artist-idealist, clashed woundingly with Richardson. Richardson was the first of a series of luthiers-craftsmen with whom Tertis worked and then fell out over this or that unauthorized change to the design. These larger violas made their way in the music world. They had their vogue and as White points out have now been relegated to an interesting historical development. Intriguing to see whether the ‘original instrument’ lobby will in future go back to the Tertis model to perform works written during its heyday from the 1940s to the 1960s. Intense feelings were provoked by the new design and these erupted into a letter war in the pages of The Strad. Vaughan Williams always referred to his 1940s film music efforts as his war work. In the case of Tertis he felt that his contribution must be to recant from retirement and get back into giving concerts. This he did in 1939. In December 1941 he premiered RVW’s Suite for viola and orchestra. The next year it was Dunhill’s Triptych for viola and orchestra – a work surely meriting revival perhaps coupled with Dunhill’s symphony. He also made and performed arrangements of three sonatas by John Ireland – the cello sonata and the two violin sonatas. The detailing of this book includes a sequence of appendices. Appendix 1 lists the different violas played by Tertis year by year. There are plans of the Tertis violas. A short selection of his published articles is included. The Tertis BBC appearances are there from 21 December 1924 to 29 December 1966 – one of the most fascinating aspects of the book. His honours are surveyed as are the works with which he was associated including those commissioned by him or dedicated to him. The book is completed by a bibliography and a 19 page index. I am pleased to see the scholarly notes placed as endnotes from page 303 onwards. This certainly aids readability. There is also a discography showing his move from Vocalion (1919-1924) to Columbia (1924 –1933) to HMV (1924-1947). It is piteous that he did not record more substantial works. Into the bargain this very substantial volume costs only £25.00. What is it that Boydell do to keep costs down when compared with other specialist music publishers? Students of Tertis and the viola are an obvious market for this splendid book. In addition, anyone with an interest in the English musical renaissance will find the pages thronged with composers from that era. A well structured, sturdy and fascinating account of a life - a crusade for the viola and its repertoire.